The use of real estate deeds in the state of Washington is authorized by RCW 64.04.010, which states that "every conveyance of real estate, or any interest therein, and every contract creating or evidencing any encumbrance upon real estate, shall be by deed." Furthermore, a real estate deed has to be in writing, signed by the grantor or other party bound by it, and acknowledged by the grantor before an officer who is authorized to take acknowledgments of deeds (RCW 64.04.020). Individuals of legal age, as well as corporations, have the legal capacity to hold or acquire property in this state, which gives them the legal authority to convey the same to a grantee who in turn has legal authority to receive real property. In Washington State, an alien may hold and acquire land, any rights to land, or interest in land by purchase, devise, or descent; and can also convey, mortgage, and devise the same with the same effect as if the alien were a native citizen of the state of Washington or the United States (64.16.005). A conveyance of real estate or interest in real estate is facilitated through the use of a real estate deed, the commonly used forms of which in Washington are warranty deeds and quitclaim deeds. Property rights, as well as the owner's right to dispose of his or real property, are determined by the manner in which the property is held. 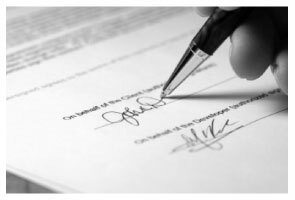 The grantor to the real estate deed is required to sign and have his or her signature acknowledged by a person authorized to take acknowledgments. When the acknowledgment is certified as required by law, the instrument may be recorded in the recording office in the county where the property is located (RCW 65.08.070). In Washington, county auditors are responsible for recording real property instruments. The officer taking acknowledgements shall certify the same by a certificate written on or attached to the real estate deed. If an instrument is acknowledged in a state other than Washington, it must be accompanied by an attached certificate from the clerk of a court of record from the county wherein the acknowledgement was taken, unless the out-of-state acknowledgment was taken before a commissioner appointed by the governor, before the clerk of a court of record, or before a notary public having a seal of office. (RCW 64.08.020). Aside from acknowledgements, real estate deeds must meet additional statutory requirements, as outlined in RCW 65.04.045, in order to be recorded. Every conveyance in Washington that is not recorded is void as against any subsequent purchaser or mortgagee in good faith and for a valuable consideration from the same vendor, of the same real property or any portion of it whose conveyance is first duly recorded. (RCW 65.08.070). Conveyances must be recorded in order to be valid against third parties. The order of recording determines the priority of instruments against subsequent purchasers of the same real property. Recording a document gives constructive notice of its contents. brenda S. said: Excellent instructions very easy to follow!